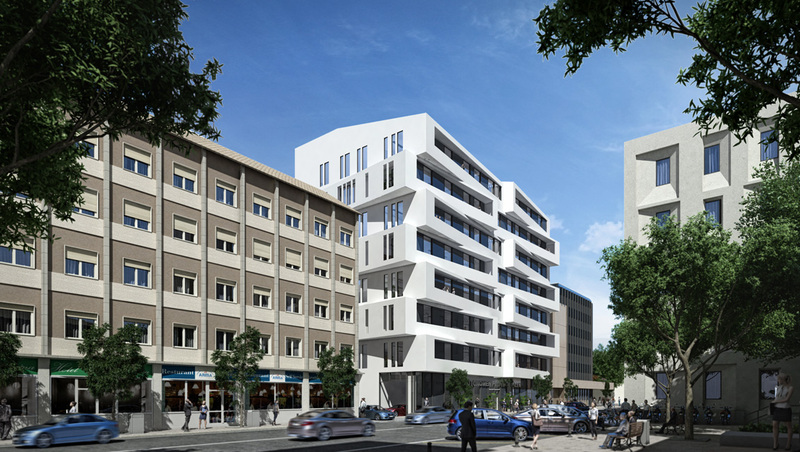 The project for the new Bolzan district building aims to be a relevant element for the city and merges together architectonic research and functional research, to satisfy the client requirements. The volumes of the new building, the cleanness of architectural lines and the reflection of glass panels, contribute to design a building which is very recognizable in the city context. It has a contemporary language and at the same time is very innovative, conform to its public service. The building has 8 floors above ground and 4 below ground. 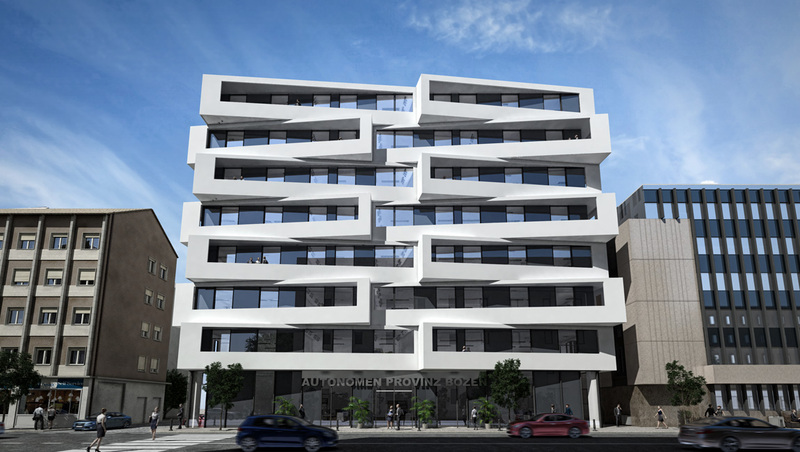 Ground floor has a linear facade, which is made by a crystal strip where the entrance is easily recognizable because of a metallic text that is “Autonomen Provinz Bozen”. Above levels, with office use, could be considered as single volumes, each one is oriented 15 degree respect the following one. An animated facade is created which keeps the internal line of the glass wall on the same plane, from ground level to the roof. Glass windows are alternated with reflecting panels which will cover opaque external walls. On the street elevation the above described volumes generate a games of shadows and lights, that are well related with the context. Vertical windows on the shorter sides found a relation with the vertical orientation of the two neighbor buildings facades. 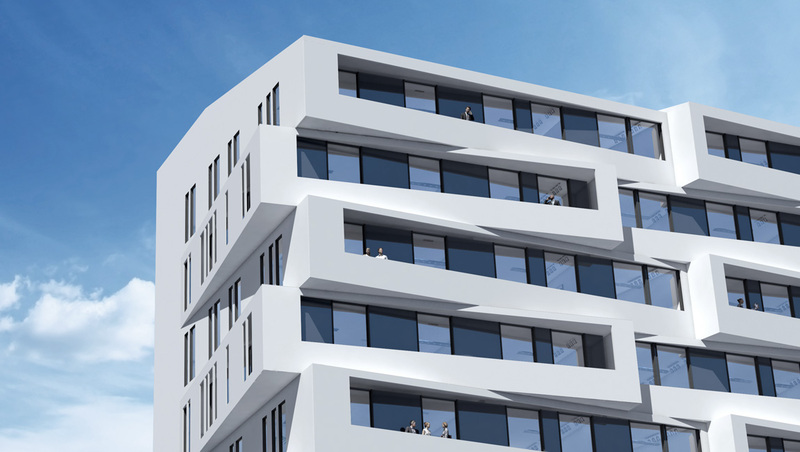 The North-West facade, which is the coldest side, is designed as a blank wall so to use the maximum of the area suitable for building and give more room to the offices. Small horizontal cuts are created on this facade close to stairs compartments and to the meeting rooms for ventilation purpose. Coming from Renon street the perception of the building is very rich thanks to the mix of shadows, lights and reflections generated by the rotated volumes. It will possible to feel the urban-architectonic prominence of the building, full of contemporary. 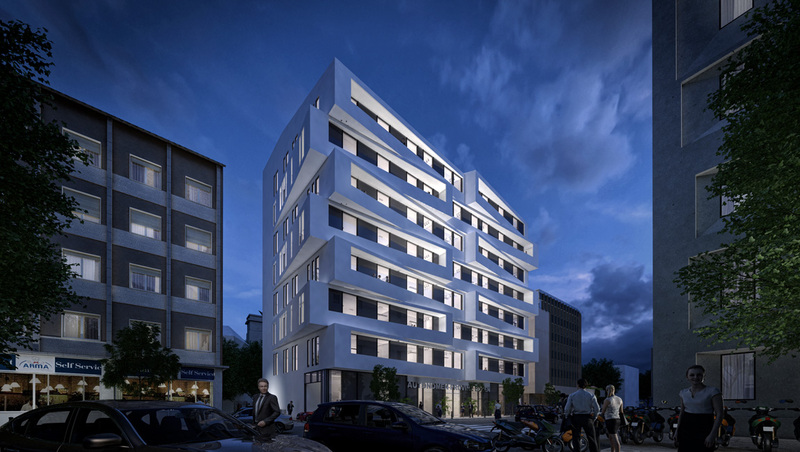 The white color of the external skin has been chosen to increase the clean linearity of the architecture and to keep a chromatic relation of continuity with the opposite district building. the structure is composed essentially by a main structural wall (which run all along the length of the North-west side), and by two row of columns. The distance between the wall and the first row of columns is 7m. In this strip all vertical connections and bathrooms are located. In the second strip between the two row of columns the span is about 10 meters. In this way it is possible to have a wide flexible space to have use changes or modification of interior layout, because is a free column space. The main access to the building is on Renon Street. The two emergence exits are on the North-West (Particella n. 576), guaranteeing a good evacuation, in case of need. Two accesses with two lift for cars which connect the street to the second level below ground that has car parking destination. A small ramp is for bicycles and motorbikes only and goes down to the first level below ground. The entrance hall, at the ground level, is a generous and functional space. A desk is placed to receive the personal and visitors. Form this central point is easy to reach the vertical connections (two lifts for people and one elevator). All service point requested by the program competition are guarantee at functional level. At the basements all the surface suitable for building is used respecting totally the competition program and limitations. At the first level there is the bikes and motorbikes parking. At the second level below ground 14 car parks a re placed (because of the low number of car parks a ramp is not used otherwise a consistent interior area had to be destined to it). All basement levels have two stair compartments, lifts and elevator, a with a filter zone. Ventilation is guaranteed at all levels as regulation claims. Offices are located on 7 floors above ground. At each levels there are bathroom services. Square meters requested are verified. The layout of all floors is simplified by the structure that doesn’t have pillars inside this area. Locals for office use have face the side of the building (except for the North-West side with natural daylight and ventilation appropriate). The area around the central core has been destined to functional services. The circulation is easy because of a corridor which leads the the two opposite stair compartments, connects the two office zones which generally have different functional use. The finish hight of interiors is 2,8 meters as requested with an hight floor to floor of 3,5 meters to leave the right space for the technical floor, false ceiling and machinery. Two emergence stairs, each with filter zone with constrained ventilation for smokes suction, give a safe evacuation at every levels without incurring at any risk of crowding, respecting the current regulations. Offices interior walls will achieve an high acoustic insulation power to guarantee quality to the working ambient. They will be easy to disassemble in a way that the interior office layout could be modified in accordance with the requirements of single department or for whatever other reason that could come sometimes. Very important point of the project is the thermal insulation of the building. The North side, being a blank facade whiteout any important openings, properly insulated, will have a very low thermal dispersion. The other exterior walls are 50 cm thick to achieve an adequate insulation. 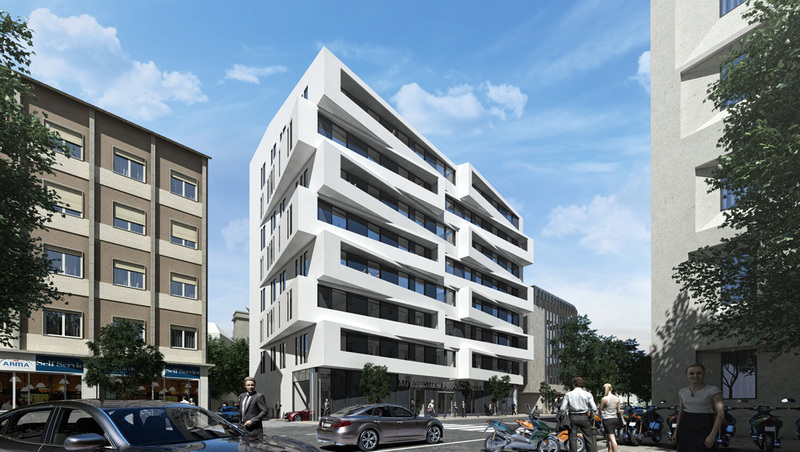 coherent with the standards of passive buildings. The roof slope goes from North-West to South-East side. It is convenient to install solar panels because the South-East orientation has an elevated sun exposition.